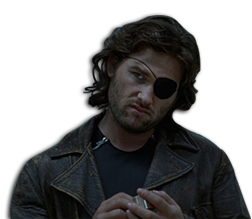 Try storing one from calling the Mercs on someone, that might work. If he starts a new thread, he gets yelled at for for not using the search option. if he posts on an old thread then he gets yelled at 4 necro posting. OT: No pics of my mesa (yet). I'm thinking about chrome roll cage. Does it look good or does it ruin the look? Feel free to post anything on this thread only if its related to the Mesa. Stay on Topic. Can I post pictures on mobile or only PC? Post any way you like! I just got this 2 days ago. I like to change mine often. Before anyone asks, the bumper some how fell off the first pic. I posted an official thread once, then the moderators took the word away and gave it to someone else. That was the first time I ever used the word "butthurt" upon myself. 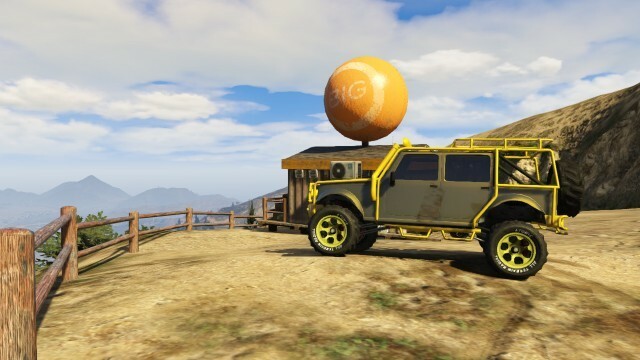 To complete my selection of themed cars, I desperately needed a Mesa. I knew they were rare and was happy to bide my time. I was in a session and I spent about 45 minutes following two guys, constantly being a nuisance. Much to my surprise and joy, they sent mercs on me (wow the mercs are very UP). I excitedly grabbed the Mess and drove home in panicky fashion. I replaced my Akuma and rested thinking my car was safe. 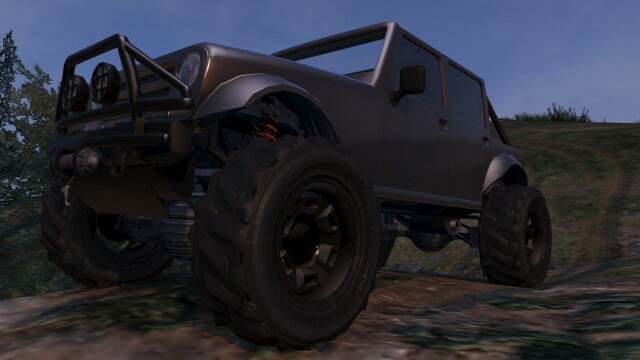 In merry mood, I drove around LS as King of the Jungle, and I decided to pick up some of other players for a fun cruise on me new ride. Unfortunately the first guy I met happened to be a complete dicksh*tf*cker and blew me up. No worries, call my mechanic but then oh f*ck, I didn't insure. Since, I have pathetically messaged around 7 players, begging for mercs. Alas this has only resulted in violence (non-merc) against me. 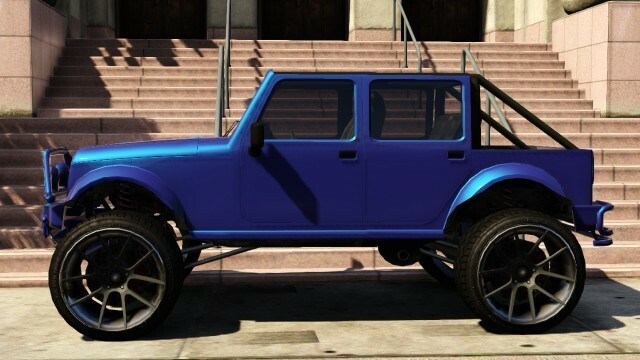 Is there still a way to get the no bars merryweather mesa? You can still keep the ones from the gang attack over by the military base. No need to call the merc's on anybody. After completing the gang attack and your in the Mesa go to the highway and head south. Shortly after hitting the highway you'll go thru the tunnel and the long bridge on the other end of the tunnel. At the end of the bridge on your right there'll be a blue circle/job trigger for the race Long Haul II, pull the Mesa into the center of the blue circle and get out of the Mesa. You will have a join/host page pop up, hit O to quit and you'll be shown walking away from the blue circle/job trigger. Your PV that you used to get to the gang attack will spawn down the road to your left on the bridge and the Mesa will spawn across the road in front of you. Now that Mesa can be kept, just pull it into your garage to get the free tracker or if in a session with others and your worried about someone blowing it up, go directly LSC and track/insure it. This will not work if any other players are near by. You'll quit the job and the Mesa will still be in the blue circle/job trigger. So do it in an IO lobby or when nobody's up near your location. Just wondering there is NO way to take that front bumper off or the rear bumper or to add the spare tire without adding the whole roll cage right? Need to add a hardtop cageless to my collection. 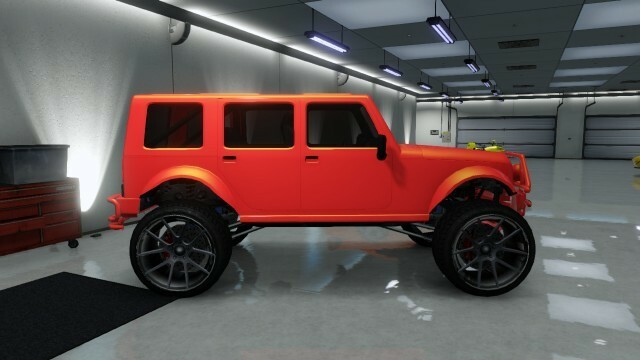 Fully-lowered (because it's a bit top-heavy otherwise), and with all the upgrades I can throw at it. 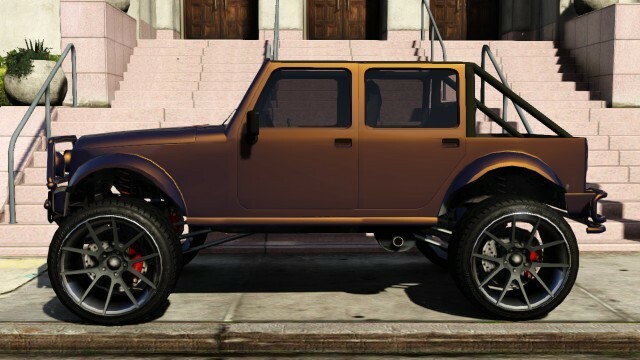 It's probably outstripped by the recent arrival of the Dubsta 6x6, but I prefer the look of the Mesa - it's more 'military', IMO. Also, here's my original - the 'proto-Wrathmobile'. Liked the open-body version, but figured the extra protection at the rear was worth it. 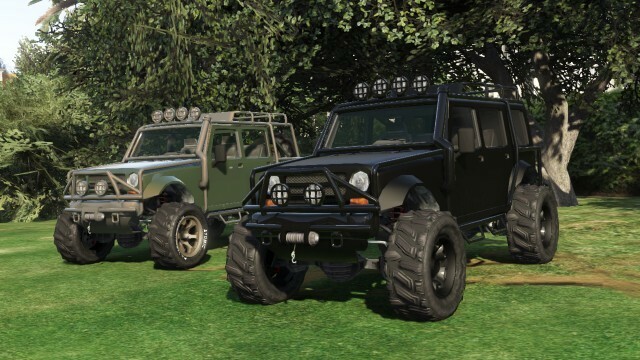 That, and there's a marginal colour difference with the 'khaki'/olive drab version, compared to the stock grey/black ones - the grey/black ones have a slate interior, while the 'camo' one has a more olive interior, which can't be resprayed in LSC. Couldn't sell it, so had to bite the bullet - ditched it for a closed-body black one, which got a Midnight Purple respray (see above). 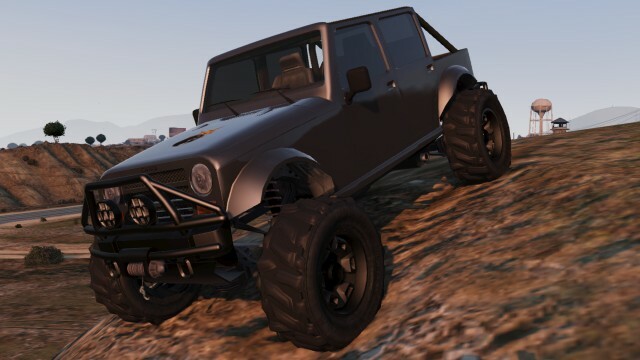 Despite being a fan of off-roading, I'm really not a fan of the Merryweather Mesa. I always found it to be a little too top heavy, and very unstable on road, the 90/10 (approx.) power split between the front and rear wheels isn't great either. Always preferred the Karin Rebel. 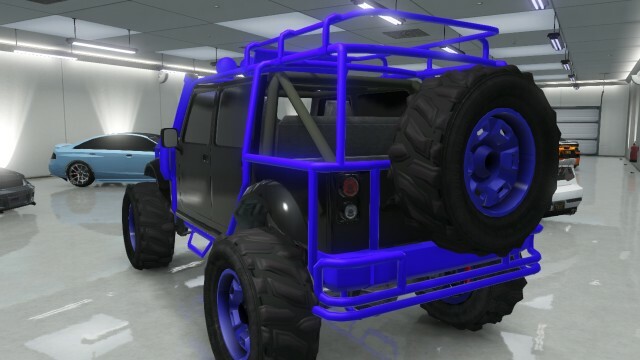 My old crew colour with slate blue wheels. Good for climbing, but a little too top heavy. Agreed. 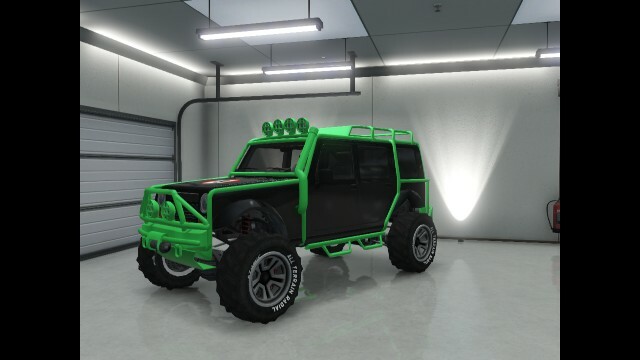 I was really excited to test mine out after I'd nabbed it from Zancudo during Base Invaders, I was less excited after I realised it has the off road ability of a golf cart. Looks cool though, speaking of which could you tell me where that picture was taken? I've seen it a few times on the forum and been wondering for a while. The very south end of the canal. By looking on the map, it is where the canal widens.